During the summer months the street animals feed well on scraps put out by restaurants, hotels, tourists and residents too. Many animal loving visitors even bring cat/dog food out here with them, so concerned are they about the welfare of the street animals here. When the tourist season ends, however, it is a very different matter! Hotels and many restaurants and shops close. Tourists leave and villas get locked up. Food for the animals becomes scarce. Now, with the help of dozens of volunteers Kapsa has an established winter feeding programme in Kalkan extending from Kışla to Kızıltaş and from Kalamar to Kördere etc. Each volunteer keeps Kapsa informed of how many animals they are feeding in a particular area, and Kapsa gives them an allowance of dog or cat food accordingly. 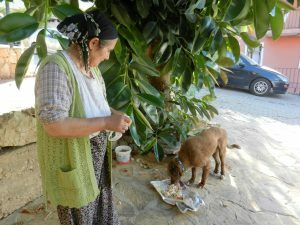 This not only keeps the animals from going hungry but also stops many of them migrating to the centre of Kalkan in search of food in and around the few restaurants that remain open all year. Also, dogs that are fed are less likely to become aggressive – hungry dogs, on the other hand, naturally become more competitive and otherwise docile dogs may turn vicious in their pursuit of food. 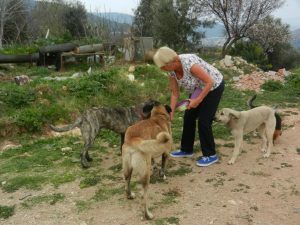 With dogs now being fed in many different areas of Kalkan they remain spread out and no longer ‘pack’ together. Thankfully, fights and injuries due to hunger are pretty much a thing of the past. 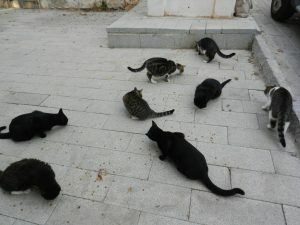 It is not an easy task to manage the programme and a lot of organisation and work goes into it to ensure that the Kalkan street animals are cared for as best we can and the feeding programme runs alonside the winter neutering too. Neutering is the only humane way of managing the stray animal population and we neuter over 500 animals each year in Kalkan and the surrounding villages, plus our support of belediye village neutering programme days. 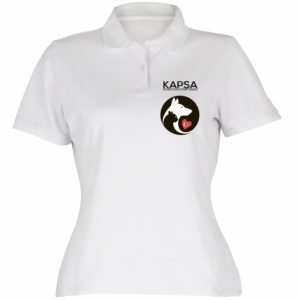 Each year the programme starts again – a feeder will register with Kapsa and they will provide the tag numbers of dogs they are now feeding and photos of the cats. If a dog is untagged it may have lost its tag over the years but we have a registration system so we will check that the dog has been neutered and identify it. If unneutered we will spring into action to resolve that. We have a responsibility to ensure the food goes to the right animals, sometime people will come to get free food because it’s free, sadly they may not even be feeding street animals and we have even heard of someone trying to sell it! They were not poor people either….Of course most people are very honest and want to help the animals and they understand the need for checks. We also want to make sure one dog isn’t going to several people and other animals are getting nothing. People are wonderful and they will supplement the food we give them by cooking pasta etc. These animals are used to human food and often prefer it. The program normally gets under way early to mid November. Hard work has gone into clearing out parts of HQ to create an area for food distribution. We have agreements with suppliers about how and when we receive the food. We have a feeder who has takes food for the harbour dogs, these dogs can find things particularly hard and we dont want to hear that they have become disruptive because of hunger, they are used to lots of attention and a good source of exciting food. We know that some people are feeding animals alongside their own and do not ask for or want food. People often feed the animals scraps too and even cook especially for them! Some dogs often get a home cooked meal! 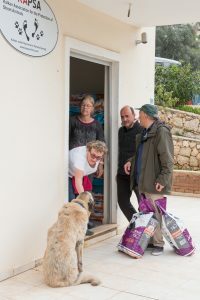 We are always seeking more volunteers, especially in areas of Kalkan not yet covered, to ensure that all the animals are fed. If anyone knows where there are cats or dogs that may need feeding please contact us.